Let us preface this article by saying that we don’t condone stealing – even if it is done in the coolest possible way. But now that that’s out of the way, we kind of wish we could be best friends with the guy who built this robot. 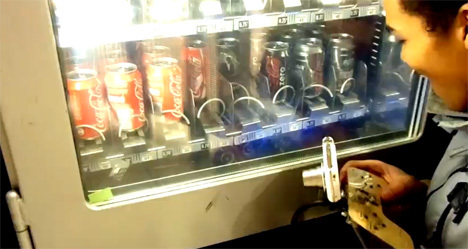 It’s a little bot that you stick into the bottom of a vending machine – say, one that dispenses tasty chilled beverages – and then uses a remote-controlled arm to carefully extract a soda. The video below is in French, but you can get the gist of what the guy is saying by watching him work his magic. Grabbing a soda from a machine is kind of like playing one of those infuriating claw games, but with no supply of quarters needed. The man is an evil genius, and while – again – we can’t suggest you try something like this at home, we have to admire his skill and ingenuity. We also have to wonder how much all of that machinery cost him and how many sodas he would have to steal before building the robot arm became worth it.